Freely Educated: MaMa Appeal & Slouchy Hat Pattern. MaMa Appeal & Slouchy Hat Pattern. 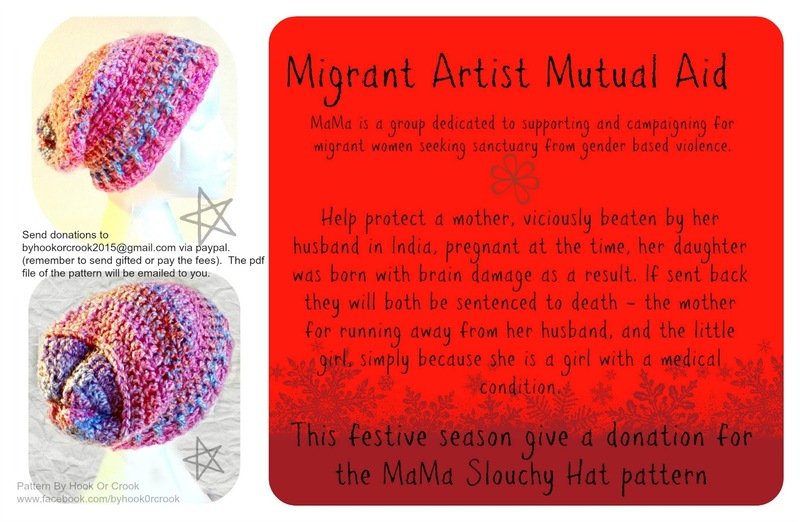 So, the group that meets weekly in Rose Howey asked me to create a hat pattern that they could then follow to make and sell to raise funds for MaMa (Migrant Artists Mutual Aid), and in particular for one of the women who attends with her 2yr old daughter. Mum, is threatened with being returned to India, the daughter was born in the UK, but if she is sent back with her mum, both will almost certainly be killed. Mum's husband beat her while she was pregnant, she fled to the UK to seek sanctuary, her daughter was born here, and has brain damage as a result of the beatings, which requires medical supervision. Mum is currently fighting to stay, if sent back she will be brought in front of her tribal council, which is all male, her husband will lie, and the council will sentence her and her daughter, (because girls are not valued, and certainly not with medical conditions) to death. Please, please help us to raise funds to help this small family stay here and be safe. I have written the slouchy hat pattern, which is suitable for beginners (and includes links to tutorials and videos for special stitches). I'm asking folks to make a donation for the pattern - I suggest £5, but honestly, anything you can afford is gratefully received. The pattern is for personal use, although if you wish to make hats and sell them for MaMa that would be wonderful. This is the Slouchy Hat Pattern Please use the Donate button on the side bar. Thank you so much! All proceeds from sale of hats and donations for the pattern will go to MaMa.